Princess just released their Alaska program for 2017, and, Surprise! It looks very much like 2016, although it has bulked up a little. The complete story appeared in the March 25 edition of Cruise News Daily. why Adam Goldstein doesn't think cruising to Cuba is a going to be a big thing for the cruise industry for a while. The complete article appeared in the March 25 edition of Cruise News Daily. If Donald Trump is going to build a wall, Holland America is going to give you a way to sail around it. The line announced a 2016-2017 winter schedule to the Mexican Riviera that is expanded from last winter and sails with a larger ship. Next winter, the 1,916-passenger Westerdam will sail 13 seven-night cruises round trip from San Diego to Mexico. The itinerary calls at Cabo San Lucas, Mazatlan and Puerto Vallarta. It also has three full days at sea to enjoy all Westerdam has to offer. The complete story appeared in the March 24 edition of Cruise News Daily. Remember When Swiping Something Used to Be a Bad Thing? Princess Cruises has a new app coming that can help you identify your travel personality, and will suggest cruises for you based on what it learns about you. Details appeared in the March 24 edition of Cruise News Daily. Viking Ocean Cruises took delivery of their second ship, the 48,700-ton Viking Sea, today at Fincantieri’s Ancona yard. The ship is a duplicate of the first ship, Viking Star, which launched last April. Harmony of the Seas, the world's largest cruise ship, is nearing completion at the STX France Shipyard in Saint Nazaire, France. Just a matter of days away from handover to Royal Caribbean, all that's left to do is cosmetic work. In this one-minute video, Royal Caribbean gives us a one-minute tour of the world's largest ship. Warning for those who are susceptible: High flicker rate in this video. Viking Ocean Cruises said yesterday they have ordered three additional sister ships to the three they already have or are under construction at Fincantieri. The three in the new order will be delivered by 2020. The announcement came at the float out of Viking Sky, the third ship in Viking’s ocean fleet, at Fincantieri’s Ancona yard. Viking Sky is expected to be delivered in early 2017. The complete story appeared in the March 23 edition of Cruise News Daily. Photo courtesy of Fincantieri. All rights reserved. May not be copied or used without express permission. Holland America's Koningsdam is nearing handover to the line. In the seventh video in the Countdown to Koningsdam series, Hotel Director Stan Kuppens talks about the officers and crew arriving at the shipyard. P&O's Britannia will be skipping it's call at Zeebrugge (Belgium) this weekend due to the tragic events in Belgium earlier this week. Century Casinos will expand to operate the casino aboard Thomson Discovery. Details appeared in the March 23 edition of Cruise News Daily. Seabourn has partnered with three-star Michelin Chef Thomas Keller for a new signature restaurant aboard their ultra-luxury ships, which will replace Restaurant 2 now found on the existing ships. The complete story appeared in the March 22 edition of Cruise News Daily. STX France is putting the finishing touches on Harmony of the Seas because delivery is less than 100 days away. Eurodam is now ten times cleaner. After 309 voyages from Galveston, Carnival Triumph bid farewell to the Texas port. Details appeared in the March 22 edition of Cruise News Daily. Carnival Corp received approval today from the Cuban government for their Fathom brand to operate their proposed seven-day cruises from Miami to Cuba beginning the first week of May. The line had already received US approval some time ago. Fathom will be the first cruise line to sail from the US to Cuba in 50 years. This isn’t the first time US citizens have been allowed to travel to Cuba in 50 years. Many US citizens have been going there in recent years, but it was limited to only certain categories of people who could legally travel there - those with family in Cuba, students on a school program, journalists, those on some sort of cultural program, and the like. With today’s approval of Fathom, now “Joe Anybody” can go. While anyone (who has a couple thousand bucks) can now go, there are still restrictions on what you can do, or more precisely, what you have to do, and what you can’t do, while you are there. But even those have been streamlined or relaxed some since Fathom first proposed the cruises. 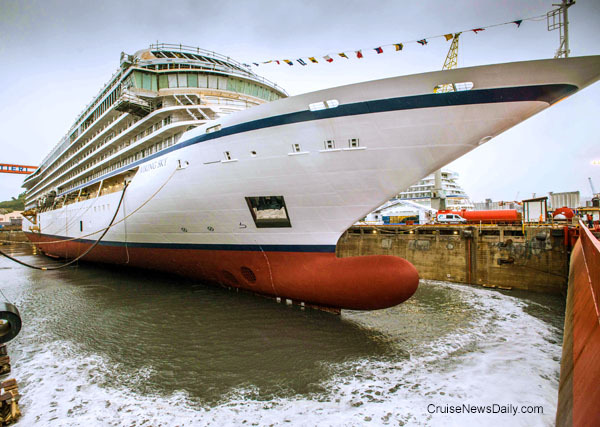 The complete story appeared in the March 21 edition of Cruise News Daily. AIDAprima might be setting a record for the longest delivery trip of a cruise ship as it sails from Japan to Germany. AIDA reports it has finished the first stage of the trip and arrived at Singapore on Sunday (March 20). On Tuesday the ship will set sail for its next port call at Salalah (Oman), where it is expected to arrive on March 29. Details appeared in the March 21 edition of Cruise News Daily.